Buyers Laboratory LLC has named its top picks for 2014’s document image solutions of the year, recognizing the top vendors in hardware and software. Buyers Lab said the multinational company scored the award for the comprehensiveness of its solution, as it focuses on document management, document capture and workflow, cost accounting and recovery, print management, and mobile printing. Buyers Lab noted Xerox had a number of strong offerings in its portfolio, like the DocuShare line of document management products, its Mobile Print Cloud and Mobile Print Solution, ConnectKey for SharePoint, and Scan to PC Desktop Professional 12. Ten of these solutions netted Buyers Lab’s top rating of five stars in its reviews, more than any other original equipment manufacturer. For the printer and multifunction printer (MFP) awards, Buyers Lab chose Samsung Electronics America as its 2014 outstanding monochrome printer and MFP line of the year, while Hewlett-Packard Co. won the same award, but in the colour printer category. This is the second year in a row that Samsung has nailed the top spot for this award, with Buyers Lab citing its cost-effectiveness, its eco-friendly features, and the uncomplicated user experience the brand provides. (Image: Samsung). 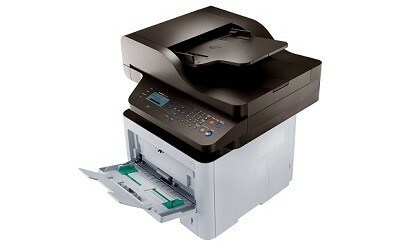 A monochrome multifunction printer, the SL-M3870FW. For HP, this is its fourth year in a row to hold this title, though it also won back in 2008. With tools like HP Access Control and HP Web Jetadmin, office managers can limit the amount of colour ink employees are using in the workplace, saving businesses money. Buyers Lab also noted HP is extremely reliable, with the MFPs able to record 85,200 scans altogether without any misfeeds or paper jams. Plus, none of the devices tested started malfunctioning, or required any servicing. HP also took home another award – Buyers Lab’s outstanding achievement award for its innovations in mobile printing. HP has been using near field communication (NFC) and Wi-Fi Direct technology to allow users to start a print job just by tapping an NFC-enabled smartphone or tablet to an accessory that plugs into some of its printers. (Image: HP). The HP 1200W mobile printing accessory. “Mobile printing in enterprise environments has its own set of challenges; for the user, the first step is connecting to the printer, which isn’t always easy,” said Marlene Orr, a senior analyst for Buyers Lab, in a statement. In November, we took a tour of HP’s printing campus in Boise, Id., getting a look at its new printers and mobile printing solutions. Check out our coverage here. And for a list of Buyers Lab’s other picks, head on over here.